End of US Imperium? Is Barack Obama About to Suffer a Glorious Defeat in Congress? The coalition of the willing is now down to the US alone as France now wants to wait for more data on alleged gas usage. Yet, President Obama rejects G20 pressure to abandon Syria air strike plan. Inquiring minds note that Obama plans a 'full-court press' to sway Congress and a speech to US citizens on September 10. Obama's address to the nation from the White House on Tuesday will be part of a rejuvenated lobbying effort on Syria as Congress returns to Washington next week. A Democratic congressional aide said the administration is planning "a full-court press" aimed at undecided lawmakers. According to a Washington Post count, only 23 senators have been willing to go on record in favor of military force, while 17 are against. 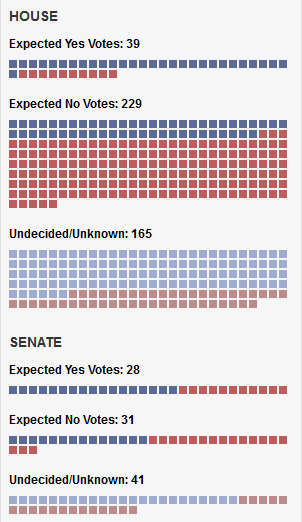 It will likely take 60 of the Senate's 100 members to advance the measure to the House of Representatives. In the House, where 218 votes will be required to pass the resolution, only 25 members are on record in support of military action so far, according to the Post, with 106 opposed. House Speaker John Boehner, R-Ohio, backs President Obama's request for authorization to intervene militarily in Syria, as does House Democratic Minority Nancy Pelosi, D-California. Senate Majority Leader Harry Reid, D-Nevada, is similarly "in," while Senate Minority Leader Mitch McConnell, R-Kentucky, in mum. The president has done a pretty good job of selling his plan to congressional leaders. He has not, however, sold it to the American people. Thus, when members of Congress decide which side they're on in the Syrian intervention votes that are expected to take place next week, they will have to consider whether they want to respond to pro-war pressure from inside-the-Beltway—as so many did when they authorized action against Iraq—or to the anti-war sentiments of their constituents. The United States says it has determined that the Syrian government has used chemical weapons in the civil war there," the Post/ABC poll asked. "Given this, do you support or oppose the United States launching missile strikes against the Syrian government?" Sixty percent of registered voters (59 percent of all respondents) express opposition. Just 36 percent support intervention. Self-identified Democrats are opposed 54-42—a 12 point gap. Republicans are opposed 55-43—a similar 12 point gap. Independents disapprove of intervention by a 66-30 margin. That figure suggests that members of Congress who represent swing districts might actually be more vulnerable if they vote to authorize the attack. Nichols referred to a Huffington Post article quoting Congressman Alan Grayson, D-Florida, "nobody wants this except the military-industrial complex". "One thing that is perfectly clear to me in my district, and I think is true in many other districts from speaking to other members, is that there is no desire, no desire on the part of people to be the world's policeman," Grayson said on SiriusXM's "The Agenda with Ari Rabin-Havt," which aired Thursday morning. "For us to pick up this gauntlet even on the basis of unequivocal evidence of chemical warfare by the Syrian army, deliberately against its own people -- even if there were unequivocal evidence of that -- that's just not what people in my district want." That doesn't mean that opposition is universal, Grayson allowed. "I did notice, for what it's worth, that the manufacturer of the missiles that would be used has had an incredible run in their stock value in the last 60 days. Raytheon stock is up 20 percent in the past 60 days as the likelihood of the use of their missiles against Syria becomes more likely. So I understand that there is a certain element of our society that does benefit from this, but they're not the people who vote for me, or by the way the people who contribute to my campaign," he said. "Nobody wants this except the military-industrial complex." The End of US Imperium—Finally! An article on The Daily Beast by David Stockman contains so much uncommon sense that it makes me want to stand up and salute! Please consider The End of US Imperium—Finally! by David Stockman. Next week Congress can do far more than stop a feckless Tomahawk barrage on a small country that is already a graveyard of civil war and sectarian slaughter. By voting "no," it can trigger the end of the American Imperium—five decades of incessant meddling, bullying, and subversion around the globe that has added precious little to national security but left America fiscally exhausted and morally diminished. Indeed, the tragedy of this vast string of misbegotten interventions—from the 1953 coup against Mohammad Mosaddegh in Iran through the recent bombing campaign in Libya—is that virtually none of them involved defending the homeland or any tangible, steely-eyed linkages to national security. They were all rooted in ideology—that is, anti-communism, anti-terrorism, humanitarianism, R2P-ism, nation building, American exceptionalism. These were the historic building blocks of a failed Pax Americana. Now the White House wants authorization for the last straw: namely, to deliver from the firing tubes of U.S. naval destroyers a dose of righteous "punishment" that has no plausible military or strategic purpose. By the president's own statements, the proposed attack is merely designed to censure the Syrian regime for allegedly visiting one particularly horrific form of violence on its own citizens. Well, really? After having rained napalm, white phosphorous, bunker busters, drone missiles, and the most violent machinery of conventional warfare ever assembled upon millions of innocent Vietnamese, Cambodians, Serbs, Somalis, Iraqis, Afghans, Pakistanis, Yemeni, Libyans, and countless more, Washington now presupposes to be in the moral-sanctions business? That's downright farcical. Nevertheless, by declaring himself the world's spanker in chief, President Obama has unwittingly precipitated the mother of all clarifying moments. The recurrent phony narratives that generate these war-drum campaigns and then rationalize their disastrous aftermaths are rooted in a common structural cause: a vastly bloated war machine and national spying apparatus, the Imperial Presidency, and the house-trained lap-dogs that occupy the congressional intelligence, foreign affairs, and defense committees. This triangle of deception keeps the American public bamboozled with superficial propaganda and the media supplied with short bursts of reality TV when the Tomahawks are periodically let fly. But it is the backbone of the permanent warfare-state bureaucracy that keeps the gambit going. Presidents come and go, but it is now obvious that virtually any ideological script—left or right—can be co-opted into service of the Imperium. The Obama White House's preposterous drive to intervene in the Syrian tinderbox with its inherent potential for fractures and blowback across the entire Middle East is being ramrodded by the dogma of "responsibility to protect." In that context, its chief protagonists—Susan Rice and Samantha Power—are the moral equivalent of Bush's neocon hit men, Douglas Feith and Paul Wolfowitz. In both cases, ideological agendas that have absolutely nothing to do with the safety of the American people were enabled to activate the awful violence of the American war machine mainly because it was there, marching in place waiting for an assignment. "After having rained napalm, white phosphorous, bunker busters, drone missiles, and the most violent machinery of conventional warfare ever assembled upon millions of innocent Vietnamese, Cambodians, Serbs, Somalis, Iraqis, Afghans, Pakistanis, Yemeni, Libyans, and countless more, Washington now presupposes to be in the moral-sanctions business?" There is much more in the article. Please take a look. David Stockman is also the author of The Great Deformation: The Corruption of Capitalism in America and the #1 New York Times bestseller The Triumph of Politics: Why the Reagan Revolution Failed. Is this the "End of U.S. Imperium"? Finally? We should all hope so. Previous How Is The Economy Getting Better When the Number of Private Sector Jobs Fell by 278,000 Last Month?